Enjoy skiing, spas, shopping, farmhouse food, and more in this classic New England town. The Woodstock Inn & Resort. Used to be that Woodstock, Vermont, was just someplace you passed on the way to Killington; a picturesque New England village with covered bridges, Paul Revere bells, and a mountain that paled in comparison with the icy action further north. But in recent years, a series of upgrades and openings has restored Woodstock to the destination status Laurance Rockefeller — venture capitalist, staunch conservationist, and grandson of John D. — originally imagined when he invested in the town back in the 1960s and ’70s, envisioning a place that recognized winter as a season to be enjoyed, and not just endured. Rockefeller would surely be proud, as the modern-day Woodstock deserves far more than a drive-by. Not too rural, not too urban (it’s still Vermont, after all), the town is the Hollywood version of New England come to life: top-notch restaurants, too-cute shops, and fireplaces a-plenty strung along a walkable downtown dotted with historic homes. Just two hours from Boston, it’s an easy weekend escape, with plenty to do both indoors and out. SKI / So, yes, there’s Killington, its six peaks, 212 trails, 29 lifts, and thousands of college kids just 20 miles away. Between natural and man-made snow, skiing here is reliably good throughout the winter, and there’s plenty to do once the ski boots come off, including tubing, snowmobiling, sleigh rides, and a regular roster of live music acts (802-422-6201; killington.com). That said, Woodstock’s home mountain, Suicide Six, is quieter and more family-friendly, with 70 percent beginner and intermediate slopes that are an easy five-minute shuttle ride away. The mountain has the renown of having debuted the country’s first ski tow, which opened in the winter of 1936 on a former sheep pasture. (802-457-6661; suicide6.com). SLEEP / There’s no shame in spending most, if not all, of your time indoors, especially given the options here — and, well, it’s your vacation, so no one’s judging anyway. 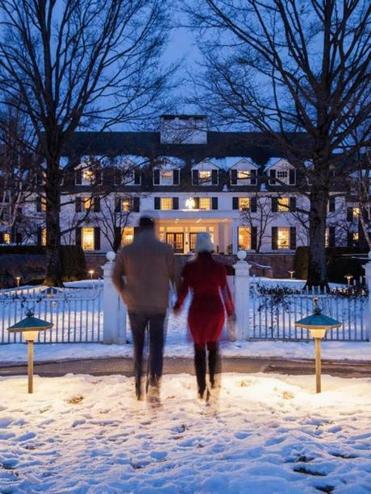 All of The Woodstock Inn & Resort’s 142 recently renovated rooms (starting at $270) feature wood-burning fireplaces and furniture made by local artisans while the inn’s two excellent in-house restaurants craft seasonal menus around local bounty (800-448-7900; woodstockinn.com). If you’re looking for a selection of quiet corners in which to read a book, look no further. Down the road, there’s also the cozy, family-run 506 On the River Inn, where all 40 rooms — decorated with finds from local yard sales and antique shops — have Ottauquechee River views (and start at $179). The highlight is perhaps the country breakfast, where the French toast is best served with maple syrup from the owners’ family farm. That’s at least one reason not to sleep late (802-457-5000; ontheriverwoodstock.com). SPA / The LEED-certified spa at the Woodstock Inn & Resort underwent a $10-million restoration five years ago, and it shows: Ten spacious treatment rooms and a something-for-everyone menu for men, women, and teens includes a hot chocolate body wrap, men’s facial, and the 100-minute-long Signature Experience, a scrub, wrap, and full-body massage using products sourced from local vendors and inspired by the season (888-338-2745). House-made macarons and an outdoor fireside whirlpool and sauna with bar service keep the winding down going for hours post-treatment. EAT / Locavores rule in Woodstock. The owners of Osteria Pane e Salute, a small second-floor bistro on a quiet end of Central Street, spend part of every year in Italy, returning with cases of artisanal wines and plenty of ideas for their Italian-style menu of seasonal “farmhouse” dishes made using ingredients so local many are culled from the owners’ own garden (802-457-4882; osteriapaneesalute.com). At Worthy Kitchen, the area’s first “farm diner,” area farms provide the ingredients for such comfort-food favorites as buttermilk fried chicken and maple-bacon chicken wings. The 18-deep craft beer list pulls from Vermont and New England, and there are also three wines on tap (802-457-7281; worthykitchen.com). SHOP / Woodstock’s Main and Central streets provide the major drags for shopping, which carries on the quintessential New England vibe starting with 129-year-old F.H. Gillingham & Sons General Store, 8,000 square feet of everything you need — Vermont maple syrup, Vermont cheddar, Vermont granola — and plenty of stuff you don’t, but which you’ll want to take home regardless, such as a Woodstock-made kazoo (800-344-6668; gillinghams.com). Owned by Susan Morgan, the Yankee Bookshop is Vermont’s oldest independent book store, around since 1935. Books on Vermont and by Vermonters — as well as classics and modern bestsellers — will bring you up to date on the lore of the locals (802-457-2411; yankeebookshop.com) while the Vermont Flannel Company promises to outfit you like one (802-457-4111; vermontflannel.com). THROW / At Farmhouse Pottery, located in a former bible bindery just beyond the main drag, Zoe and James Zilian design, create, and sell wheel-thrown tableware and vases at once eye-catching and entirely functional (802-774-8373; farmhousepottery.com). The brand’s minimalist aesthetic, exemplified by a three-quarter white glaze that leaves much of the clay body exposed, has earned them collaborations with such national brands as West Elm and Anthropologie. But the couple’s most cherished moments are in the home studio, where they offer themed workshops and personal pottery lessons, like the Couples Clay Date, which includes wine, cheese, and, most probably, more than a few references to everyone’s favorite scene in Ghost. EXPLORE / Woodstock’s snowshoe and cross-country trails see up to 80 inches of snowfall a year, range from gentle to rigorous, and are some of Vermont’s most scenic. Named after three of the town’s prominent conservationists, the historic Marsh-Billings-Rockefeller National Historic Park is home to many of them, a 23-kilometer mix of woodland trails, century-old carriage roads, and jaunts through Vermont’s first tree farm (802-457-3368; nps.gov/mabi). The Woodstock Inn & Resort’s Nordic Center, meanwhile, maintains a groomed 7-kilometer network of trails and snowshoes to rent and offers a private snowshoe dinner to the inn’s cabin on nearby Mt. Tom, where a resort chef will cook for you and your pals before leading you back by headlamp (802-457-6674). And new this year, the historic 10,000-square-foot Rutherford Barn is now home to New England Falconry and its flock of six Harris hawks, one falcon, and an eagle-owl. In partnership with Woodstock Inn, the center offers flying and handling sessions, “hawk walks,” and talks on the history of falconry and conservation under the direction of US master falconer Chris Davis (802-332-6853). SIP / Hundreds a day stop at the Long Trail Brewing Co., just outside Woodstock in Bridgewater Corners, for a pint or three of Long Trail Ale, the state’s best-selling craft beer for more than two decades. Tour the state-of-the-art brewery, where the brand’s single-barrel system churns out experimental brews in a recently acquired farmhouse annex. Afterward, settle into a corner table in the pub, where the Long Trail Burger, made of local beef — obviously — will help to clear your head, if not your belly, before the drive home. (802-672-5011; longtrail.com). Alyssa Giacobbe, a frequent contributor to the Globe Magazine, is a writer in Newburyport. Send comments to magazine@globe.com.